Remofuscin is being developed for two indications: Stargardt disease and dry age-related macular degeneration. In both indications Remofuscin is entering Phase 2. Stargardt disease is a rare indication with a high medical need. Stargardt disease patients accumulate lipofuscin in their retina. Disease onset may already occur in infants or in young adults. Progressing over the years, entire areas of the retina degenerate and this process eventually leads to legal blindness with only peripheral vision remaining. Currently, there is no approved treatment for Stargardt patients. Katairo is currently preparing a 'proof-of-concept' clinical study. The endpoints of this study will show if the effects observed in cells and animals can be confirmed in a human study. This includes first and foremost the removal of lipofuscin. Efficacy endpoints will be monitored. The dry form of age-related macular degeneration is characterized by excessive accumulation of lipofuscin in the retina of elderly patients. Although onset of the disease may occur as early as age 50, most patients with visual problems are over the age of 70. The progression of he disease is associated with growing central retinal atrophy - commonly termed 'geographic atrophy'. This results in vision loss and blindness by legal standards. 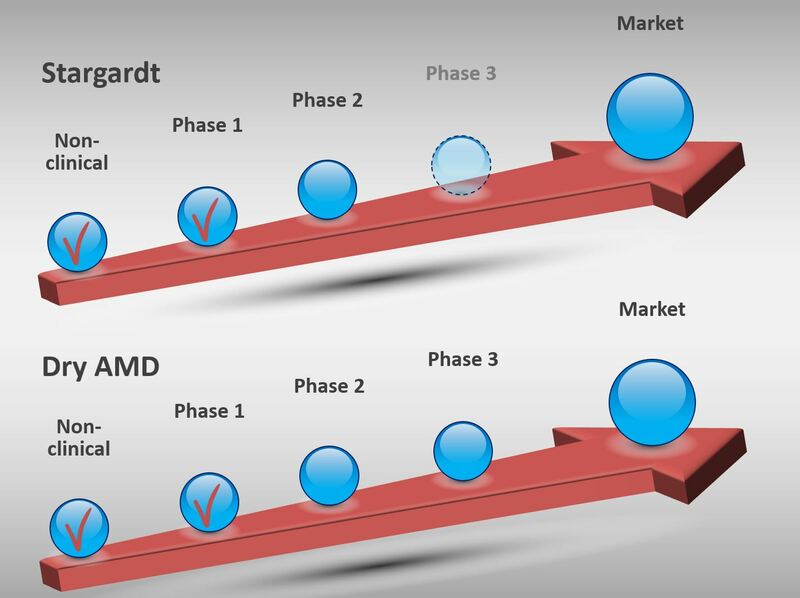 The development of Remofuscin for the treatment of dry AMD is entering Phase 2. Katairo is actively seeking funding for a first clinical study for this indication.